After a few relatively healthy weeks, the injury apocalypse is in full blown effect. Numerous superstars sustain new injuries or aggravated old ones. With bye weeks and the heart of the fantasy season approaching, here is everything you need to know about injuries going into Week 5. Randall Cobb suffered a hamstring injury late in the week and ultimately missed the Packer's showdown against the Bills. Cobb noted himself that he was not close to playing. This looks ominous and makes practice time crucial for the Packer's slot receiver. With that said, Cobb remains dicey for Week 5 and should be considered questionable until he can return to the practice field. After missing his previous two games with a hamstring injury, Leonard Fournette attempted a return against the Jets. However, shortly into the game, Fournette suffered a setback costing him the rest of the game. Coach Doug Marrone said he is uncertain when Fournette will be ready to return, but Adam Schefter noted that Fournette is likely to miss at least two games. Either way, the Jags should be without Fournette for the near future. After a strong start to the season, O.J. Howard sprained his MCL in Sunday's loss. Adam Schefter reports that this injury should cost Howard 2-4 weeks, but with the Bucs on bye this week, Howard could miss only one game. Either way, the Bucs will be without their second-year tight end for at least one game. 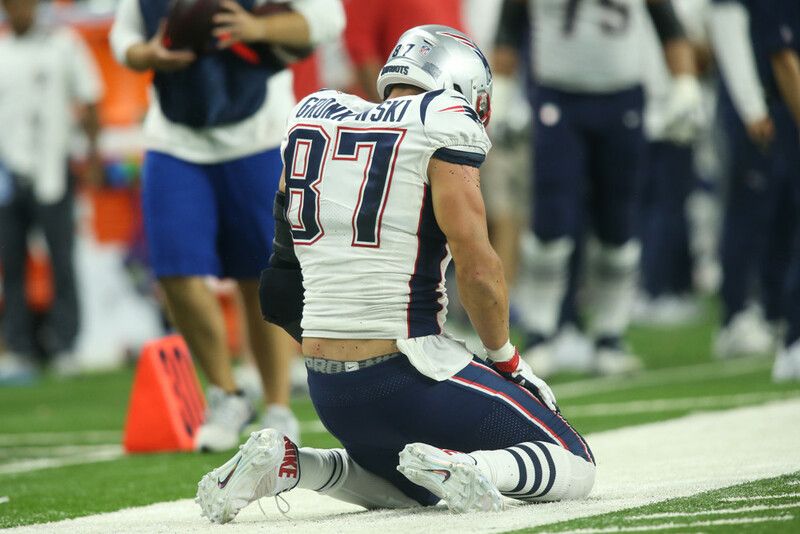 Dealing with an ankle injury coming into Week 4, Rob Gronkowski ultimately left the game due to a similar problem. It is unclear if Gronk aggravated a previous injury or sustained a new one. After the game Adam Schefter reported that Gronk's ankle injury was not believed to be serious, but Gronk ended up missing practice on Monday and Tuesday. Playing on a short week, Gronkowski looks to be on the wrong side of questionable for this Thursday's tilt. After dealing with a hamstring injury toward the end of camp and during Week 1, Will Fuller again suffered a hamstring setback. Coach Bill O'Brien said that Fuller's absence was not just precautionary at the end of Sunday's game. He also said, we will see how it goes this week, indicating that Fuller could come into this week's match as a game time decision. Tyler Eifert suffered a gruesome injury on Sunday that ended up as a broken ankle. Eifert's season is over and the Bengals will move forward with Tyler Kroft and C.J. Uzomah. Eifert has a long history with injuries and his future in the NFL remains uncertain. T.Y. Hilton left the Colt's game in the fourth quarter with a hamstring injury and did not return. On Monday, coach Frank Reich said Hilton is unlikely to play on Thursday night. While the severity of Hilton's injury has not been revealed, his early scratch from Week 5 could indicate a longer absence. Hilton should be considered doubtful for this week and questionable for any future contest. After a strong performance against the Bills, a concussion forced Geronimo Allison to the sideline late in the game. This is Allison's second known concussion and he will now battle the clock to be cleared by Sunday's game. With the Packers thin at receiver, Marquez Valdes-Scantling could be in line for an increase in snaps. For now, Allison should be considered week-to-week. After missing the last three games with a knee injury, Devonta Freeman could return in Week 5. Coach Dan Quinn spoke Monday and said he expects Freeman to play. Freeman began practicing last week and looks like likely to give it a go this weekend. He could be at risk of an in-game setback, making him a dicey start. Sammy Watkins pulled a hamstring early in Monday night's game and could not return. Particularly troubling for skill position players, hamstring injuries often require multiple weeks to heal. Already playing on a short week, Watkins should be considered doubtful for Week 5.